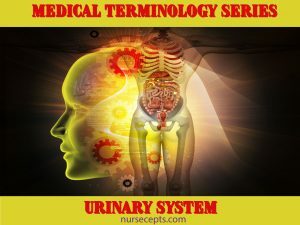 Previous articles covered the basics of medical terminology and how to change singular terms to plural terms. If you need a background on how medical terms are formed, read the article on Medical Terminology Basics. This article talks about word roots, combining vowels, suffixes, and prefixes. Also, the article 11 Rules for Changing Singular Terms to Plural Terms will be helpful. It shows how changing certain word endings can change a singular term to a plural term. 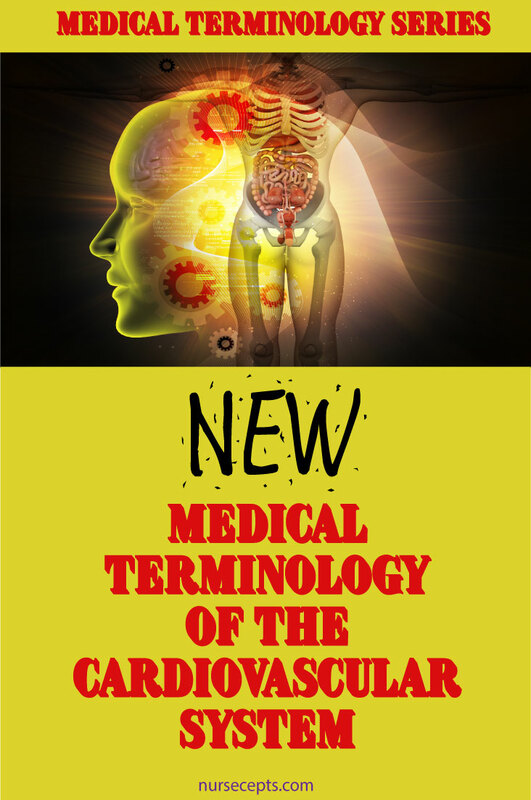 If you have not read the first two articles, you may want to review them before you dive into the medical terminology of the cardiovascular system. Medical terminology can be a lot to learn. 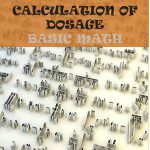 However, building a substantial medical vocabulary will help with your studies of disease processes and also help with learning basic skills. This article on Medical Terminology of the Cardiovascular system will help with the study of cardiovascular conditions and diseases. 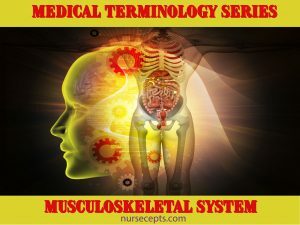 When you study medical terminology for a system such as the cardiovascular system at the same time you study the disease process, you will find it makes more sense because the terms are relevant to your studies. You will learn the terms faster and you will find your comprehension of the disease processes and their related terms will increase. Not all medical terms are derived from word parts. Some medical terms are partially created from word parts. Some medical terms do not contain word roots, suffixes or prefixes. 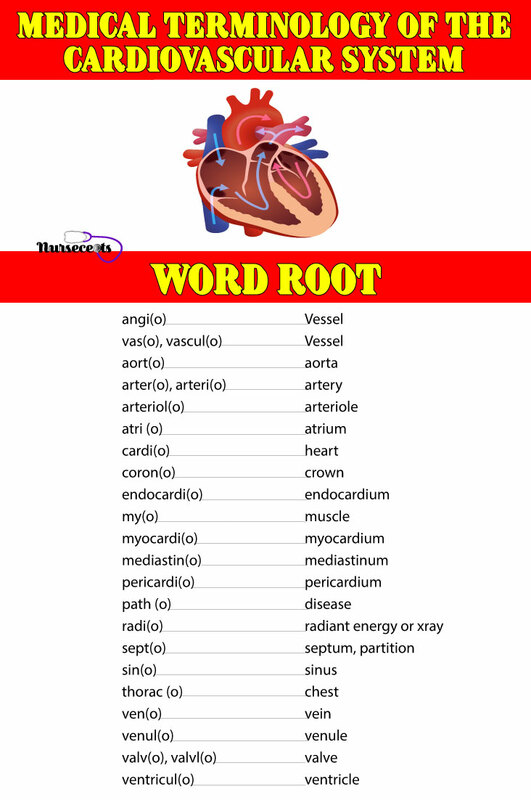 Below are lists of word roots, combining vowels, suffixes, prefixes and related medical terms that are used for the cardiovascular system. 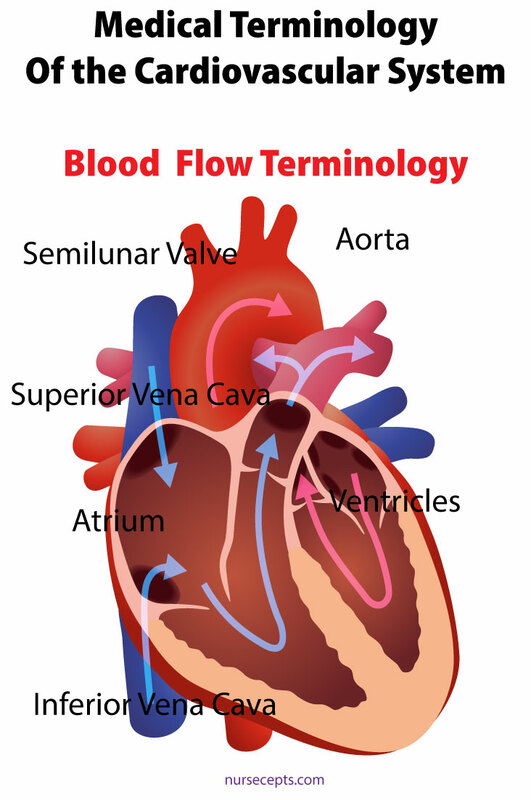 Building a foundation for the medical terminology of the cardiovascular system will move you one step closer to a valuable medical vocabulary. This is a list of word roots with their combining vowel. Notice that several word roots have the same definition. This section contains prefixes that are used for the medical terminology of the cardiovascular system. Prefixes are used at the beginning of a word to modify or vary the meaning of the word. These prefixes can be used in other body systems, however, this article shows how these prefixes can be used for the medical terminology of the cardiovascular system. When the prefixes are detached from a term, it is followed by a hyphen (-). This section contains suffixes that are used for the medical terminology of the cardiovascular system. Suffixes are placed at the end of a word root or word part to modify or vary the meaning. Suffixes can indicate a condition, disease or a procedure. When a suffix is written detached it is preceded by a hyphen (-). 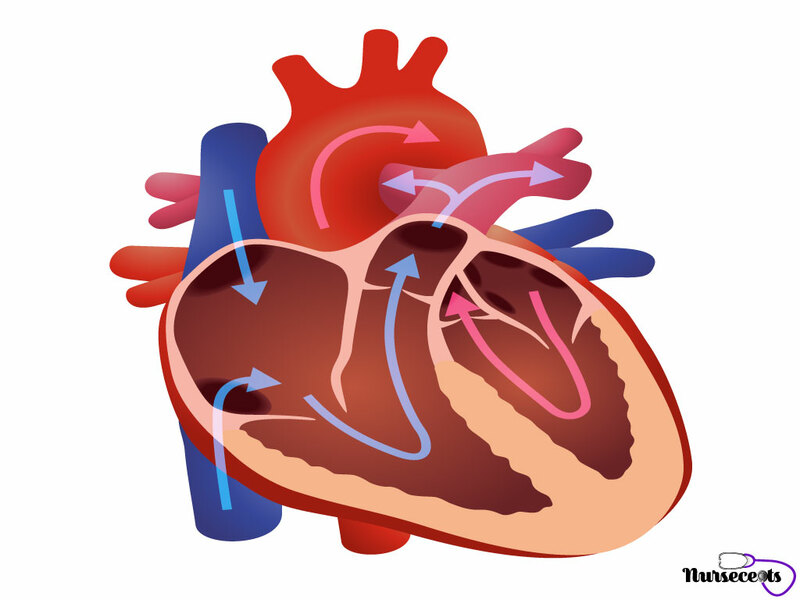 As with the prefixes these suffixes can be used for other body systems, but this article focuses on the cardiovascular system. 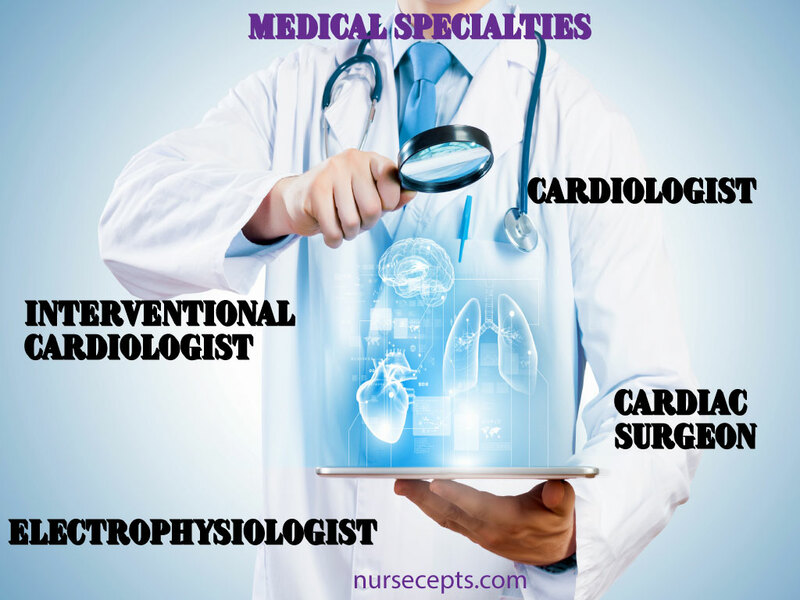 This is a list of the cardiovascular specialist and their general job description. Notice how some word roots and suffixes combine and create the description of the medical specialty. Cardiology Cardi refers to the heart . -ology refers to the study of. Cardiology is the study of the disorders of the heart. Cardiologist Cardi refers to the heart. -ologist refers to one who studies. A cardiologist specializes in disorders of the heart. A cardiologist can order and interpret the test. A cardiologist can advise the patient of their option. 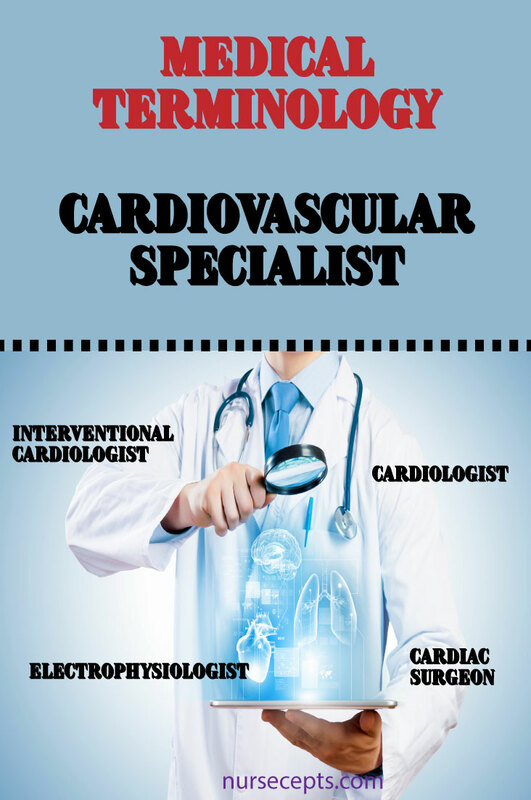 Interventional cardiologist An interventional cardiologist is a sub-specialty of cardiologists that can perform advanced cardiac procedures such as catheter-based procedures. Cardiac surgeon A cardiac surgeon can perform major procedures on the heart and the vessels. Electrophysiologist Electr(o) refers to electricity. physi(o) means related to physiology. Physiology is the study of the science and processes of the human body. Electrophysiology deals with the relationship between electrical phenomena and biological function. An electrophysiologist is a person who works with the body’s electrical and biological functions. Electrophysiologist cardiologist An electrophysiologist cardiologist studies the heart electrical impulses. The cardiovascular system consists of the heart and blood vessels. All the structures of the chest are not a part of the cardiovascular system. However, it is important to know the structures and learn the anatomical landmarks of the chest. Landmarks help understand how the heart is positioned and situated in the chest. 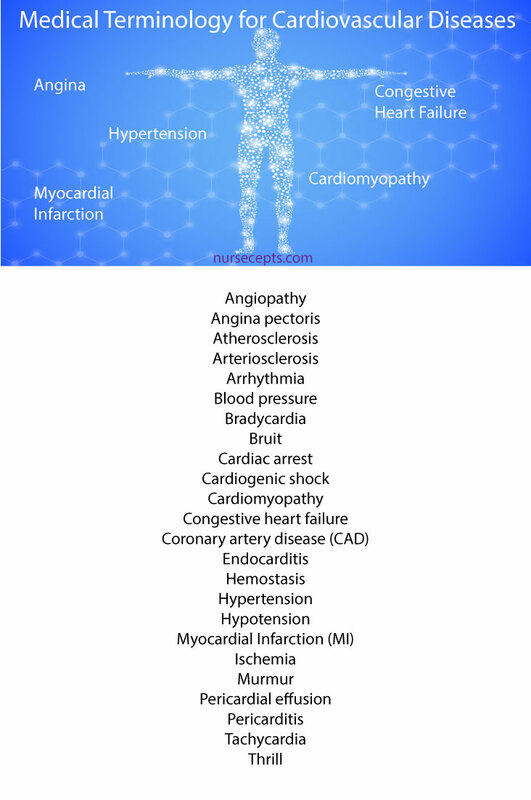 Check out the article Nursing Assessment of the Cardiovascular System to learn about the different landmarks related to the cardiovascular system. Remember, not all terms used for medical terminology use a prefix, word root, combining vowel or a suffix. But they are still used for the medical terminology of the cardiovascular system. The Angle of Louis It is believed that the Angle of Louis is named after a French physician named Pierre Charles Alexandre Louis. The Angle of Louis is the point between the manubrium and the sternum. Apex Apex means top or summits; however, it is the lowest part of the heart. Atrium Atri(o) refers to the atrium. Atria is the plural form of atrium. An atrium is a cavity or chamber. The atrium of the heart is one of the top chambers of the heart. Base The base of the heart is opposite the apex of the heart. This is the top portion of the heart. Carotid Carotid refer to the arteries of the neck that supply blood to the head and neck. Endocardium Endo- refers to within. Cardium refers to the heart. The endocardium is the innermost layer of the heart. Epicardium Epi- refers to above or outer. The epicardium is the outer layer of the heart. Intercostal Inter- refers to between. Costal means pertaining to the ribs. Intercostal refers to the spaces between the ribs. Jugular A term related to the throat. The jugular vein is a large vein in the throat. Manubrium The manubrium is the upper portion of the sternum. One of the three bones of the sternum. Mediastinum Media- refers to middle or midway. Mediastina refer to the mediastinum. The mediastinum is a portion of the thoracic cavity in the middle of the thorax, which houses the heart, trachea, esophagus and major blood vessels. Myocardium My(o) refers to muscle. The myocardium is the middle muscular layer of the heart. The pericardium is a thin sac that surrounds the heart. Point of maximal impulse The point of maximal impulse is a site on the chest wall located at the 5th intercostal space midclavicular line in which you can palpate and auscultate the apical pulse. Septum Septa is plural for the septum. The septum is a partition or wall that separates the right and the left side of the heart. Sternal The term sternal pertains to the sternum. It is also a suffix meaning sternum. The sternum is a flat bone located in the upper anterior portion of the chest. Thorax Thorax refers to the chest. -thoracic is a suffix meaning the chest. The Thorax is the upper part of the trunk which contains the heart and lungs. The plural forms are thoraxes, thoraces. Ventricles A ventricle is a cavity located at the bottom of the heart. Ventricular pertains to the ventricle. Aorta The aorta is a major portion of the arterial circulation which branches off the left ventricle and carries oxygenated blood to the circulation. Artery Arter(o) refers to the artery. An artery is one of the large blood vessels carrying blood away from the heart. Arterial Arteri(o) refers to the artery. Arterial means pertaining to the arteries. Arterioles Arterioles mean little artery. Arteriovenous Arteri(o) refers to the arteries. Venous refers to the veins. Arteriovenous refers to the arteries and the veins. Atrioventricular Atri(o) refers to the atrium. Ventricular refers to the ventricles. Atrioventricular is a connection between the atrium and the ventricles, electrical or anatomical. Capillary Capillary is a Latin word meaning hairlike. A capillary is one of the microscopic blood vessels. Coronary The term coronary refers to encircling structures. The coronary arteries refer to the arteries that branch off the aorta and encircle and supply the heart. Intravascular Intra- refers to the middle. Vascular refers to the blood vessels. Intravascular means inside the blood vessels. Inferior vena cava Inferior means lower or situated below a given point. Vena refers to a vein. Cava refers to a cavity. Inferior vena cava is a large vein that brings deoxygenated blood from the lower part of the body to the heart. Semilunar valves Semi- refers to half. Luna refers to the moon. A valve is a structure which prevents the backflow of fluids that pass through it. -valve is also a suffix meaning a thing that regulates the flow of. Semilunar valves are valves in which the cusps are shaped like half moons, such as the pulmonary and aortic valve that keep the flow of blood in one direction. Superior vena cava Superior means higher or situated above a given point. The superior vena cava is a large vein that brings deoxygenated blood from the upper half of the body to the heart. Valve -valve is also a suffix meaning a thing that regulates the flow of. A valve is a structure which prevents the backflow of fluids which pass through it. Vascular The term vascular means blood vessels. Vein Ven(o) refers to a vein. A vein is a blood vessel that collects blood from the capillaries and carries it back to the heart. Venule Venule means small vein. A venule is one of the small blood vessels that collect blood from the capillary. Afterload Afterload is the resistance which the left ventricle has to pump. Automaticity Automaticity is the property of the specialized cells of the heart that allows them to self-activate. 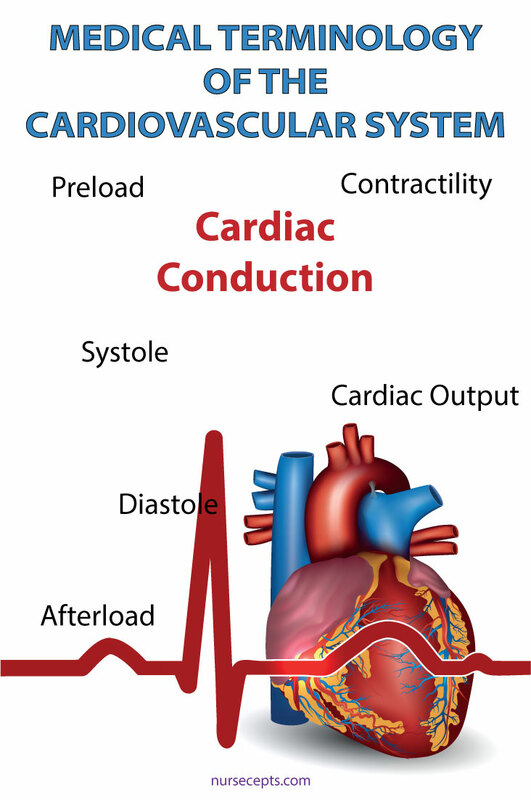 Cardiac output Cardiac output is the amount of blood ejected by the heart with each heartbeat. Contractility Contractility is the ability of muscle tissue to contract. Diastole Dia- refers to apart or through. -stole is a suffix meaning contraction. -diastole is also a suffix meaning period of dilation of the heart. Diastole is the period between contractions or the resting period of the heart when the ventricles are filling or dilating. Diastolic Diastolic pertains to diastole or the blood pressure during the relaxation of the heart. Electrocardiograph (ECG) Electr(o) refers to electric. Cardi(o) refers to the heart. -graph is a suffix meaning product of a drawing, writing or recording. An electrocardiograph, also known as an ECG is used to record the electrical activity of the heart. Electrocardiogram Electr(o) refers to electric. -gram means a drawing or a written record. An electrocardiogram is a record produced by the electrocardiography. Preload Preload is the stretch of the muscle fibers at end diastole. Systole Sy- means an association. -systole means type and location of a higher blood pressure measurement. Systole means the contraction of the heart. Systolic Systolic is the pressure created when the ventricles contract. This is the top reading of the blood pressure. Doppler echocardiography An echo is the reflection of an ultrasound wave off a structure which is sent back to the transducer. A Doppler echocardiography uses Doppler ultrasonography to evaluate blood flow patterns and directions in the heart and records them. Doppler ultrasonography Ultra means beyond, farther. A Doppler ultrasonography uses ultrasound imaging to look at the structures and blood flow of the beating heart. Echocardiography Echo is the reflection of an ultrasound wave off a structure back to the transducer. -graphy refers to the process of recording. A echocardiography is a noninvasive diagnostic procedure used to record the movement and structure of the heart. Echocardiogram Echo is the reflection of an ultrasound wave off a structure back to the transducer. An echocardiogram is a graphic reading of the heart movement from an ultrasonography. Electrophysiology study (EPS) Electr(o) refers to electricity. An EPS study is a procedure that uses electrode catheters to pace the heart and sometimes induce an arrhythmia to detect problems with the conduction system of the heart. Magnetic Resonance Imaging (MRI) Magnetic means lodestone. An MRI is a procedure used to produce an image by the creation of a magnetic field to give detailed information about the cardiovascular system. Tomography Tomo- refers to the preparation of a section. A tomography is a sectional imaging to produce a film with a detailed cross-section of tissue and organs. Transesophageal echocardiography (TEE) Trans- refers to through. Esophageal refers to the esophagus. 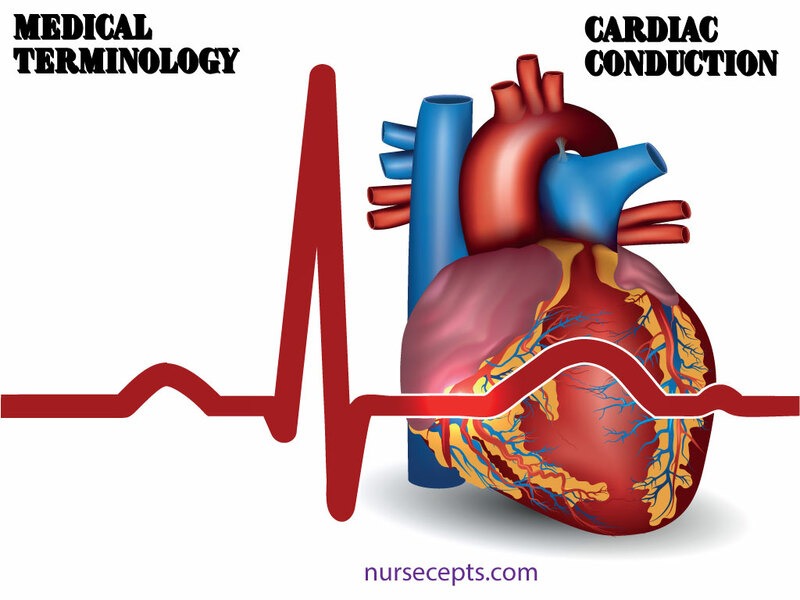 Electrocardiography is a noninvasive diagnostic procedure used to study the movement and structure of the heart. A transesophageal echocardiography (TEE) is an ultrasound using an endoscope that views the heart from a retrocardiac vantage point. That is the endoscope is passed down the esophagus. Ultrasound Ultra means beyond, farther. Ultrasound imaging is the process of using high frequency sounds waves to visualize internal structures. Cardiac catheterization Cardiac refers to the heart. A catheterization is the introduction of a catheter into a body cavity. A cardiac catheterization is the introduction of the catheter through an incision into a large vein and guided through circulation into the heart. Cardiopulmonary resuscitation (CPR) Cardi(o) refers to the heart. Pulmonary refers to the lungs or the respiratory system. Resuscitate means to revive. Resuscitation is a process to sustain the cardiac and respiratory functions. Cardiopulmonary resuscitation is an emergency procedure that involves external cardiac massage and artificial respirations to revive and sustain the cardiac and respiratory function. Coronary artery bypass graft (CABG) The term coronary pertains to encircling structures. A bypass is one of several surgical procedures used to shunt blood or fluids from its natural course. A graft is a tissue or an organ taken from one site or person and connected to a different site or inserted into another person. A CABG is an open heart surgery in which a vein is taken from a different part of the body (saphenous or mammary) and grafted into a section of a coronary artery to bypass a blockage. Defibrillation De- is a prefix meaning to do the opposite, away, off, to remove entirely, down and from. Fibrillate means the contraction of a single muscle fiber that is repetitive. Defibrillate means to stop the ventricles from fibrillating by delivering an electrical shock. Endarterectomy End- refers to within. Arter(o) refers to the artery. An endarterectomy is the surgical removal of the intimal lining of an artery. Percutaneous Transluminal Coronary Angioplasty (PTCA) Per- refers to through. Angi(o) refers to a vessel. A PTCA is a procedure in which a catheter is threaded through the vessel and a balloon is inflated in the treatment of atherosclerotic heart disease in the coronary arteries. Pericardiocentesis Peri- refers to around. A pericardiocentesis is a procedure used to aspirate fluid which has accumulated in the pericardial spaces. Thoracotomy Thorac(o) refers to chest. A thoracotomy is a surgical opening into the thoracic cavity. Thoracentesis Thora refers to chest. A thoracentesis is the perforation of the chest wall or pleural space with a needle to aspirate fluid. Transplantation Transplantation is the transfer of tissue or an organ from one person to another or one organism to another. Angiopathy Angi(o) refers to a vessel. -pathy refers to a disease. Angiopathy is a disease of the blood vessels. Angina pectoris Angi- refers to a vessel. Angina is a choking feeling in the throat caused by not enough oxygen to the myocardium of the heart from the blood vessels. Pectoral refers to the chest or thorax. Angina pectoris is thoracic pain caused by spasms in the coronary arteries caused by not enough oxygen to the myocardium of the heart. Atherosclerosis Ather(o) refers to an artery. Atherosclerosis means the build-up of fatty plaque or cholesterol in the lining of the arteries. The walls become thick, fibrotic and calcified. Arteriosclerosis Arteri(o) refers to an artery. Arteriosclerosis means hardening of the arteries due to calcification, thickening and loss of elasticity. Arrhythmia A- refers to without. Rhythmia refers to the rhythm. Arrhythmia means an irregular heart rhythm. Blood pressure Blood is the liquid pumped from the heart through the blood vessels. Blood pressure is the pressure exerted on the walls of the arteries by the circulating blood volume. Bradycardia Brady refers to slow. Cardia refers to the heart. Bradycardia means a heart rate less than 60 beats per minute. Bruit A blowing or swishing sound caused by turbulent blood flow heard when auscultating diseased carotid arteries. Cardiac arrest Cardiac refers to the heart. Arrest means to inhibit, restrain or stop. A cardiac arrest is a sudden stoppage of cardiac circulation and cardiac output. Cardiogenic shock Cardi(o) refers to the heart. -genic refers to causing, forming or producing. Cardiogenic refers to originating in the heart. Shock is a condition characterized by inadequate blood flow to the body. Cardiogenic shock is a condition associated with a myocardial infarction resulting in a low cardiac output. Cardiomyopathy Cardi(o) refers to the heart. My(o) refers to the muscle. -pathy refers to the disease. Cardiomyopathy is a disease of the myocardium causing enlargement. Congestive heart failure Congestive refers to congestion which is an abnormal accumulation of fluid. 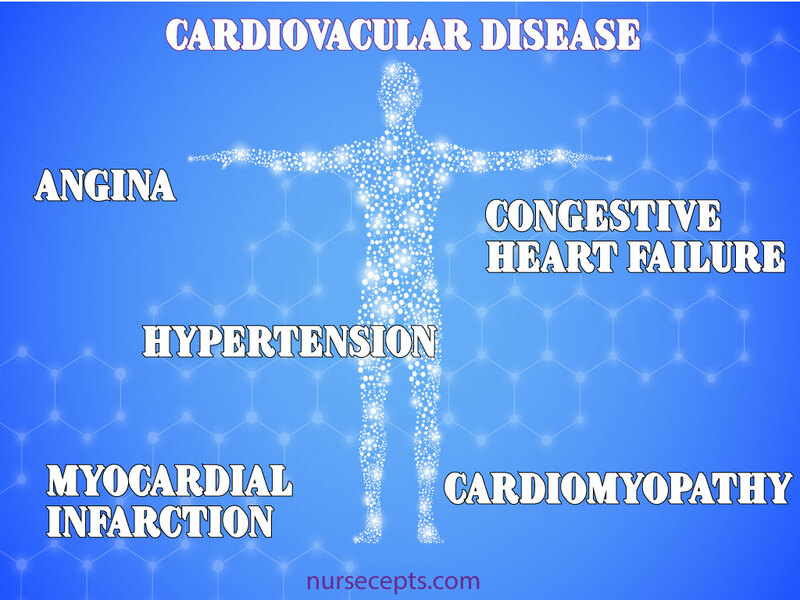 Congestive heart failure is a condition in which the cardiac output is impaired and is unable to meet the needs of the body causing an abnormal accumulation or backup of fluid and peripheral edema. Coronary artery disease (CAD) Coronary refers to encircling structures. Coronary artery disease is a condition affecting the arteries of the heart that cause a reduction of blood flow to the myocardium. Endocarditis Endo- refers to inward or within. Card refers to the heart. Endocarditis is the inflammation of the endocardium and heart valve. Hemostasis Hemo- refers to blood or blood vessels. Hemostasis is the halting of bleeding by the coagulation process or by chemical or mechanical means. Hypertension Hyper- refers to excessive, above and beyond. Tension refers to stretch or pressure. Hypertension is a common condition characterized by an elevated blood pressure when there is an abnormally high amount of pressure on the arteries. Hypotension is a condition characterized by a low blood pressure or when there is not an adequate amount of pressure in the arteries for normal perfusion. Myocardial Infarction (MI) My(o) refers to muscle. Cardial refers to the heart. An infarct is a localized area of necrosis. An MI is necrosis of part of the cardiac muscle caused by an obstruction of the coronary artery that affects the heart ability to pump. Ischemia Ischemia means to hold back blood. Ischemia is a decreased blood supply to a body part. Murmur Murmur refers to humming. A murmur is a humming or a gentle blowing such as a heart murmur. Pericardial effusion Peri- refers to around. Effusion means to pour out or the escape of fluid. Pericardial effusion is the escape of fluid into the pericardial sac. Pericarditis Peri- refers to around. The pericardium is the sac that surrounds the heart. Pericarditis is the inflammation of the pericardium. Tachycardia Tachy- refers to fast. Tachycardia is a condition in which the heart beats at a rate faster than 100 beats per minute. Thrill A thrill is a vibration felt over an area of the patient’s body caused by turbulent blood flow.